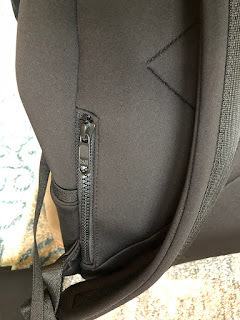 Marianne and I both recently bought backpacks so we thought we'd do a review together! I have a thing about neoprene. 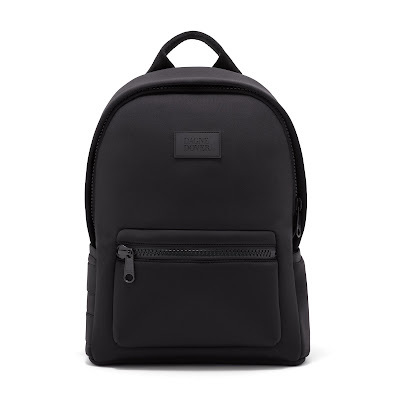 I love the way it looks and this damn Dagne Dover neoprene backpack kept following me all over the Internet. So I did what I always do, I ignored the expensive backpack I loved and ordered a cheaper one instead. It shipped out to me crazy-quick and when it arrived and I pulled it out of the box I was like, "Huh." While I love how minimal it is, it's still a pretty significant bag and I was worried it would be too big and too heavy when packed. I almost returned it! But I decided to live with it a bit and fake-packed it to see what it would hold and was surprised at how comfortable it was to carry. Definitely not too heavy or hot. So, I took the tags off and started to really use it. My computer is a 15" laptop which is really too big for the laptop compartment (the large size Dakota will better fit a 15") but it'll fit in the regular compartment without issues. I also love that this backpack comes with fun extras - a shoe bag and a little matching zippered pouch. I've mostly used it as a work tote alternative but it's also great for carrying my yoga gear when I have to trek across campus for lunchtime classes. I haven't traveled with it yet (two months until Paris!) but it will easily carry all that I need for travel (I'll do a post about it before my trip.) I do really wish it had a sleeve for attaching to my suitcase handle but I don't travel a ton, so not a big deal for me. My Only Regret: I obviously bought the onyx color and while I love how sleek and minimal it looks I kinda wish I'd gone for the heather grey color because I looooove it. Why didn't I? Don't be me - go for the heather grey or dark moss. I also really love the matching pouches, especially this grey camo toiletry bag. Okay, my turn! I also needed a backpack, but mostly for business travel, not really for every day use. Unlike Adrien, I have a pretty small computer--a 13 inch Macbook Pro. It's a little baby computer and only weighs 3 pounds. However, it's still expensive and doesn't belong to me, so I needed a backpack that would protect it, plus hold my crap (more on that in a second) and not be hideous. 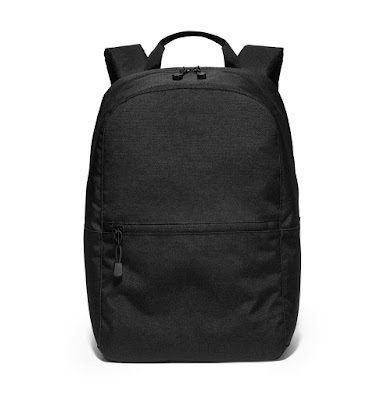 Enter the Lo & Sons Hanover Backpack. 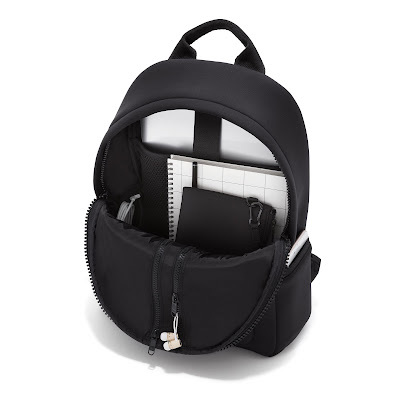 This is a really great backpack, ESPECIALLY for women. 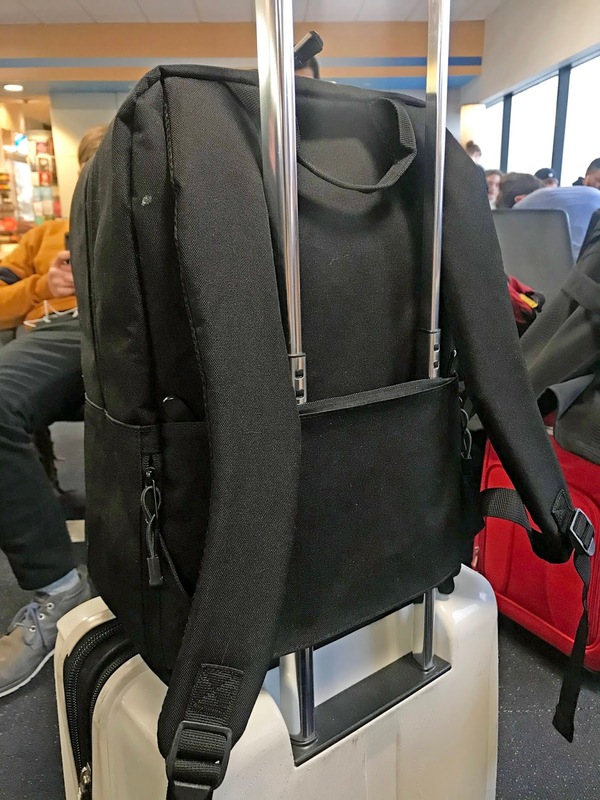 So many backpacks geared toward business travel are big and bulky and obviously made for tech bros who wear fleece vests. First off, it's very sleek with no unnecessary labels, pockets, bungee cords, or any of that nonsense. The straps are nicely padded but not over-the-top, and there's one pocket on the outside, but don't count on keeping much in there, it's pretty small. The inside has a removable insert that is pretty awesome. It has a padded section for a laptop, a place you can tuck a water bottle, and a couple of other sections. There's also a biggish center section big enough for a change of clothes, pair of shoes, and small toiletry bag. I like that the insert is removable, because if you take it out you have a lot more room to just use the backpack as an overnight bag. The absolute BEST FEATURE is the wide strap across the back that you can use to slide the backpack over the extended handle on a suitcase. 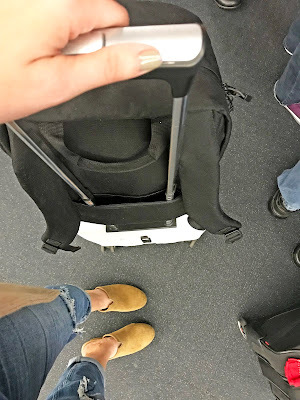 Seriously, this seems like such a small thing but it will greatly improve your life and comfort if you spend any amount of time schlepping around airports. If you aren't using a suitcase, you can zip the strap and use it as a protected secret pocket, perfect for cash, passports, or anything you want to keep safe. I had another travel backpack that just had a thin luggage strap and I found that when the backpack was full it stretched out, so this nice wide strap is perfect. Lastly, I appreciate that the backpack is a nice, lightweight nylon. It's not hot on my back, it doesn't snag, it's not shiny, it's just good and solid. Sure, $130* is a lot to drop on a backpack, but for me it was more than worth it. *If you sign up for the Lo & Sons email list you get 15% off your first full-priced order. Amazing! I've been wavering between the two and have just decided on the Lo.. This is just the review I needed! Happy Thanksgiving both! The Lo & Sons is on sale today, Black is $76, other colors $64!